During the development,sometimes it happens that we need to convert our excel file data in HTML format, In this scenario taking row and columns one by one and putting on our page is a time consuming tasks.. 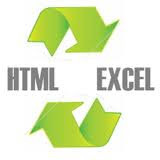 Here is a website that provide the facility to convert excel file content to HTML. Just we need to paste the excel content in this website and need to click "Tableize It". It will return the HTML for this. Same problem sometimes we face for converting the word file content to HTML. Here is a another website that provide feature to convert the word file content to HTML. Here we need to paste the word file content and click "Convert Word to HTML". It will return the HTML.